Rosie's family is a story about belonging in a family regardless of differences. Rosie is a beagle who was adopted by schnauzers. She feels different from the rest of the family and sets forth many questions that children who were adopted may have. 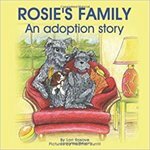 Rosove, Lori, "Rosie's Family: An Adoption Story" (2001). DIVerse Families. 364.